*I’m letting my sweet, talented friend Erin take over my blog today while I plan a fun surprise for you guys next week. :) Take it away, Erin! Hi Guys! My name is Erin Cobb and I’ve had the honor of knowing Amanda for about two years now. She’s truly one of the most creative, kind, and inspiring people I know. Basically everything you *think* you know about her is actually true! I am a professional photographer in Huntsville, Alabama which is how I’ve gotten to know Amanda. I also have a couple blogs of my own (The Pigbear and The Erin Cobb Photography Blog) although neither are anything close to what Amanda has created here at KevinandAmanda.com. I’m so proud of the amazing niche she’s carved out for herself in the great big blogosphere! I’ve been honing my craft for about 6 years now and in the course of that time I’ve gotten thousands of emails from people asking questions ranging from shooting to business to how to win the Baby Gap Casting Call. No joke. (A photograph I took of my daughter, Sarah, actually won the Baby Gap Casting Call in 2006 but I can’t say I know the secret to winning!) Far and away though the thing I get asked about the most is my editing process. 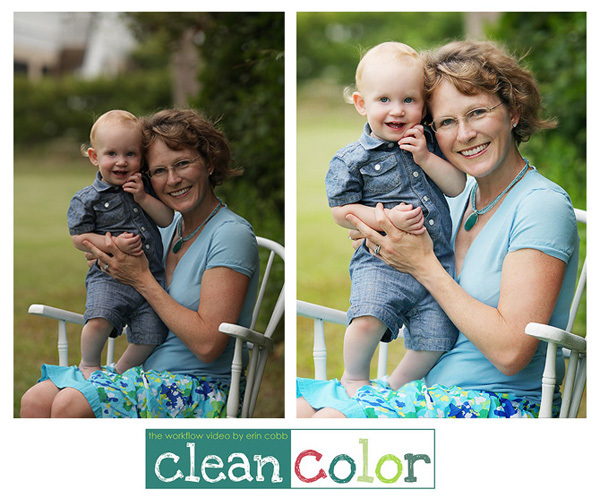 Finally last year I launched Clean Color – a product that answers that question in its entirety. Clean Color is a workflow video tutorial designed to show you my image editing process from beginning to end. There are two versions — one for Full Photoshop and one for Photoshop Elements. There is also a bundled version which contains both the Full Photoshop video and the Photoshop Elements video. In addition to the comprehensive videos (each are roughly two hours in length) you’ll also receive the shortcut actions I’ve created to use in my editing process, all of the image files showcased in the video so you can play along at home, and an appendix detailing how to get the most out of the video tutorial and where to go for additional resources. It covers almost every topic in Photoshop that you can think of – color balance, levels, curves, skin retouching, liquifying, cloning, cropping, sharpening, and much, much more. And in a nutshell, it shows you how to do this..
Head over to the Clean Color Store to learn more about how this two hour long video tutorial can change your editing process today. But before you do, drop your comment in the comments section for your chance to win a bundled version of Clean Color which includes both the full Photoshop version as well as the Elements version. The winner of the Clean Color Photoshop and Elements Bundle is #387 Tiffany. Congrats Tiffany! I’ve sent you an email. 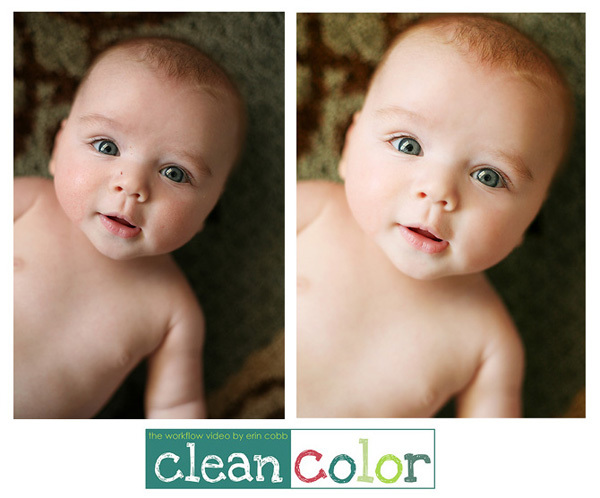 One winner will receive the Clean Color Photoshop and Elements BUNDLE ($170 value). To be entered to win the Clean Color Giveaway, all you have to do is leave a comment on this post. What do you love taking pictures of the most? Family? Pets? Food? Travel? Contest ends Saturday, March 17, 2012 at 8 pm CST. One entry per person, please. Winners will be chosen by Random.org and notified by email. Giveaway provided by Erin Cobb Photography. Previous PostPasta with Pesto Cream Sauce Next PostKevin & Amanda 10 Year Birthday Bash! 4th of July Food Ideas? Amanda always has the best giveaways! I love taking pictures of everything that I want to remember! Oh, this looks amazing. The photos are pretty to begin with, but the “after” is just incredibly. I’m just beginning to learn Photoshop, so I’d be thrilled to win something like this! Thanks for the opportunity, and I’ll definitely be checking this out! OMG! I won! Thanks so much!! ;) I really appreciate it! I love family pictures, especially of older relatives. What an amazing give-away! Thanks! My favorite subject was my dog, Katie Jo. However we had to put her to sleep this past week because of heart failure. She was my pride and joy … I miss her so very much! What I most love taking pictures of…family, pets, food, travel…YES! Definitely, all of the above. But I do need lots of help with editing. Thanks for sharing about your new product. It looks like a winner, and best of luck with your endeavors. I love taking pictures of people…strangers, people doing their jobs, people waiting in lines, people laughing, kids staring….it is just to show how people are in everyday life…I find them fascinating! Have been getting more and more intrigued by the editing and enhancement of photography. Would be a blast to win! I love to photograph life, a corner of a building, a texture, travel locations. . .everyday life. Never leave home without your camera! Thanks for your generous giveaway! This looks like an amazing tool. I would love to win it! I love taking pictures of food, but I know I have a long ways to go and lots to learn. Clear Color looks amazing! I love taking photos of our farm animals, and the nature that surrounds us. It would be great if I could take my photography to the next level. I love taking pictures of my two sweet kiddos. They are not fans of my camera, but I keep trying LOL! Thanks for the giveaway!!! I have had PSE for 3 years and don’t use it b/c I don’t know how. My favorite thing to take pictures of is my 5 year old daughter, Autumn. I love taking pictures of people, trees and churches. I’d love to make a picture book of all the beautiful churches left in the world. I love photographing people of all shapes, sizes, ages and stages! Love your clean, crisp look! Would love to win your give away! Thx! I love taking pictures of my family and pets. Although my girls are 19 and 21, they are still my favorite subjects. I recently bought an SLR and I need all the help I can get with Elements. Thank you! I am not a professional photographer but love taking photos of my family and friends. I love actions and photoshop elements for editing my not so perfect images. Would love to learn more! Wow, great giveaway! I love taking pictures of everything, but especially of my girls and the sky! Thanks for the chance! Now, I’m off to check out the video! Probably my favorite subjects include my family and travel in the same instance. Candid photos that are impromptu. I just bought photoshop (the cheap one?) and don’t really know how to use it much, so a tutorial would be just fabulous! Happy ST Patty’s Day! I love taking pictures of my daughter and making books out of them. But I really just enjoy taking pictures of everything. Photography is secretly my passion. ;) I really like your Clean Color. I will probably get it even if I don’t win. Thanks for the coupon! my kids, of course! Thanks for the chance to win! Love taking photos of landscapes and flowers, especially flowers :) Awesome giveaway. Thank you. I love taking pictures of non-moving objects. I would love a chance to win this bundle. I love taking pictures of family and friends having good time together. I love taking pictures of the city I live in at night, my little 10-month-old niece or street art. I love taking pictures of pretty much everything. I love to capture moments that are special and want to remember them through photography. I love taking pictures of places I travel to so I can have something to remember the trip by. I also take pictures of my pets because I love to capture their silly and cute moments! This bundle is perfect! I purchased a couple Photoshop Element 6 books recently so I can learn more about the software. I enjoy editing photos and making them my own! Wow–sounds like such a neat and useful video. I NEED to learn how to use PSE! I love taking pictures of anything in nature and would love to win this! What a great prize! Love Erin’s work, would be an honor to learn from her. Love taking pictures of the family! I love to take pictures if our hikes in the beautiful mountains of Colorado. Every summer I can’t wait!! The flowers, views, and colors are out of this world!! I love the clean look you produce! What a generous giveaway! I LOVE taking candid photos people! Strangers, friends, clients, but especially kids! Thanks again! I love to take picture of my creation food! I hope to win, crossed fingers! This would come in so handy…. have bajillion pictures and need to learn how to properly edit them :) My favorite subject is my daughter, but my 2nd fav is outside pictures–especially the river! My pics are ok, but they could really use some editing to become fabulous! I love taken pictures of my children and my jewelry and polymer clay design. I pain shop pro to edit my pictures but my wish is to know how to use Photoshop. This tutorial will help me A- LOT! I would love to take better pictures of my granddaughter! Pictures! Memories! I love how they bring us back to that exact moment. I would love to learn a little somthing about how Erin creates those fabulous results. What a great idea. I mostly take terrible photos of my quilts and friends and family. I make specialty cakes but my pictures aren’t always great! This would help so much. Maybe I’ll be the lucky one. Love your blog and your beautiful photos. My favorite subject to photograph? My dog Mötley & my 13 year old son …..oh, and food and anything outdoors! I love taking photos of my precious pooch, Ginger. She is the most adorable thing — a rescue Schnoodle. Thanks for the opportunity to win. This looks like an amazing thing I need to improve my photos! I am absolutely intrigued by this tutorial! I would love to be able to produce the fabulous photos that Erin does. Taking photos of my furbaby, Peanut, is one of my favorite things to do. Thanks so much for the chance to win! I love taking pictures of my son who is 2 1/2. I just found out I am pregnant with baby #2 and cannot wait to document the pregnancy and the beginning of my new little one’s life! I really wish I had been into photography when my son was born. I just got Photoshop Elements a few months ago and have been reading books and blogs on the basics and then tricks of the trade. I love what I have read so far and am seriously considering purchasing if I don’t win (but I hope I win, *wink *wink). Amanda- I just love your blog!! I love taking pictures of my family! Thank you for such an awesome giveaway opportunity! What do I love taking pictures of? All of the above, but my favorite would have to be my husband and daughter. I love taking photos of my baby girl and her doggie brother! I love taking pictures of my floppy eared basset hound. He’s the most cheerful little man ever with the most expressive eyes. I love to take pictures of nature and all the places I see on my travels. There are a lot of things I want to capture forever and I’d like to learn how to edit my pictures professionally! My favorite thing to photograph (besides my beautiful children) are newborns. They are a challenge but I LOVE LOVE LOVE being able to snuggle them and pose them in fun ways. They give me my baby fix since I am not having any more! I love taking photos of children!! Thanks for the give away!! I love taking pictures of people in real life! I love taking pictures of my kids. I have two girls that dance, so I take a lot of pictures. Great prize! Clean Color looks awesome – I hope I win. My husband will use it to clean up photos of all the amazing events he gets to entertain at (www.george-p.com), and of our children. I LOVE taking pictures of our two kids – especially at the beach and in unusual moments. Thanks for an awesome chance to win. I love taking pictures of my family, to document memories. We love looking back at photos, and I love scrap booking them! I love taking pictures of my family – hubby and two girls who are really almost grown. I want to record our lives with the camera, whether it’s a vacation, sightseeing in our “new” hometown, holiday celebrations, or just everyday events. I have a wall of photo albums and many more pictures to get put into albums. i love taking pictures of my children the most. i love when the light hits their eyes just right and i get that perfect shot. thanks for an awesome giveaway. I love taking pictures of my family! We don’t get to see each other very often so I love taking pictures of them when we do get together. I most enjoy taking pictures of nature. I love the way the colors, light, and textures come out. I am still learning alot when it comes to moving objects, inside photos and people. smiles. Love that i recognize your name from following Jennifer McGuire’s blog. Small blogosphere! Your work is amazing. I love photography, I love to take pictures of about anything, especially my family, food and close up macro shots of flowers. I would love this software to help with my photos. Thanks! I love taking pictures of everything and everybody in my life. Oh my goodness! This is exactly what I need! I love taking pictures for my children, but never have the time to sit down and *really* figure out Photoshop. What a great giveaway !!! I love to take photos of my pets, my cupcakes, & my family!! the only thing I take pictures of really is my 2 1/2 year old, Ryker. I would love to improve my skills to make even better photo memories of him! Love this blog! I enjoy taking pictures when I travel the most. We have family in Huntsville, travel there a lot and thoroughly enjoy it. I would LOVE to know how to take pictures and correct my color beautifully! Thanks for the chance! i love taking pictures of my two-year old daughter. she loves smiling for the camera! I love taking pictures of my 3 year old and 6 month old!!! I love taking pictures of my family, our adventures traveling, and the outdoors. I love taking all kinds of pictures from pets, to kids to vacation destinations. But I desperately need some pointers on how to make the best of my photos. This is just what I want to learn!! I love photographing my kids and my crafts for my blog. I have always taken the family photos but for the past 21 months that has gotten better because of my granddaughter Adele! Lots of photos – she dominates the photos and those I take of things I crochet and post on Ravelry. Cleaning up my photos would be great – thanks for the opportunity to enter your contest. Thank you so much for the opportunity to win!! I love taking pictures of my family and friends! I take the most photos of food, but I also have a passion for capturing people enjoying their life. I received a DSLR for my college graduation, and have slowly been learning to use it well. Learning photoshop would be a huge help! I love traveling and taking pictures of all the beautiful sights and of the people I’ve traveled with. What a great giveaway. By far my favorite thing to photograph is people living their lives. Capturing the fluidity in each and every day so that they can look back on those times in their life and remember. Most of my pictures are of my kids and our travels. Travel photos and photos of my dogs! Anything that strikes my fancy – besides my children anything with interesting color and contrast! Thanks for the give away. Wow! I’m blown away by your work, Erin! My Newfie, Tiberius, is my muse and my favorite subject to photograph. Beautiful. I love photographing people and food! I’ve been doing some digital scrap booking and after all the time spent making a page, I would like my photos to be sharper and clearer. I have a great camera and just need to learn how to edit my work! I have 5 kids and 11 grand kids so I have many subjects!! I like taking pictures of family best!! Excited to go to your site and read more!! Thanks for giving this away! Looks like an amazing product! I love to take photos of things in nature and travel photos come in a very close second. i also love taking pictures of nature, flowers, ferns, trees, the sky and animals. Sounds very interesting and awesome! Love taking candid shots, but my passion is gardening so can’t stay away from the shots there as well. oh my gosh, what great timing! I was just looking at my community college’s catalog to learn more about photoshop but would love to win this instead! Thanks for the opportunity! I plan on capturing my two passions: Animals & Family(s). I’m finding actions are not the path I want to take when editing photos. I really like the step by step approach you take and that its clearly visible with the same sample photos!!!! I love taking pictures of my handsome significant other and my sweet little dog (both at the same time results in the cutest pictures imaginable). I am actually torn! I love to take photos of my dogs as well as food, but unfortunately need some help on both fronts!! Thanks for this great opp!! I love taking pictures of friends and family! This is a great giveaway! Taking pics of the kids, the cats and flowers!! I love taking pictures of my family and just the every day stuff in our lives. Amazing give-a-way by the way!!! Awesome give-a-way! Thanks for the chance to win. My favorite things to take pictures of is most definitely my family and my kids sports. Would luv to learn all about photoshop elements. I love taking pictures of family, especially my baby niece, friends, travel, food, cards I create, etc, etc! Thanks for such a great giveaway! Me! Me! Me! I need help. I have two adorable, cherubic, magnificent, delicious little boys and my current photography skills don’t do them justice. Please let me win so that these years are not forever lost…..
Clean Color is the perfect description of your photography, the colors are amazing. I love taking photos of pets and landscape/scenery. I love taking pictures of my son : ) He grows so fast that I make sure to take a lot so I can always look back and remember him at any age. Thanks for this giveaway! My favorite subject is my family…My 5 year old (that just lost her first tooth) & my 4 year old twin boys… they ALWAYS challange me and make it a lot of fun with lots of giggles!!! I just found your page and LOVE it……I love to take pictures of family most (my beautiful dog included) but really everything. I just got a new camera and am really itching to really learn how to use it to its fullest. Thank you for the contest. Great giveaway! I take a lot of pictures of my son! What a great give away!!! I LOVE taking photos of my two daughters and aren’t the photographer I would like to be. I would LOVE to learn how to enhance the photos that I do take! I love taking pics of almost anything, but expecially my kiddos. I have all boys, however, and they are getting to the ages that its not cool to smile so I have to find other willing subjects to be tortured. This tut video looks fab and I would love to learn more about it. I love to capture my two teenage boys and their expressions and interests. Time is going by way to fast! I love to grab my camera and take pictures of random things that catch my eye, like a beautiful mural painted on a garage door in a run down alley, or interesting patterns found on buildings. The give away sounds awesome. I still have a lot to learn! I absolutely love taking pictures when traveling and of newborns/toddlers, couples and weddings as well as sports/underwater photos!! I love to take pictures if cupcakes! My blog is about every single cupcake I eat, so that is what I photograph! What an awesome giveaway! My teenage daughter is really into photo editing and would really benefit from them. She loves to take pictures of her friends. I, personally, enjoy taking pictures of my family. My children inspire my photography the most. I enjoy capturing their silly expressions and personality in each image! I am a food blogger and that’s what I love taking pics of. I also love taking photos of my family and our life. I’d love this to help with my photos! I love to take pictures of the city. My latest setting was Savannah, GA during the 100th anniversary of Girl Scouts and all the St. Patricks Day festivities! My kids for sure! And even better is when they decide to sit still! I love taking pictures of my 18mth old. She is my inspiration. The best part is to look back and see how much she has changed in photos. LOVE IT! Without a doubt, my favorite photography subjects are my daughters….. I would LOVE to win this prize, because I have never even delved into Photoshop yet – it seems so intimidating! I think a tutorial would be a great way to start with a clean slate, and learn how to use it from the very start! I love taking photos my 5yr old son the best! I love taking product pictures for my website ALMOST as much as I love taking pictures of my grandson. I love taking photos of my travels & family and friends. Great giveaway- thanks! Your photos are darling, love the brightness! Thanks for the chance. I love photographing my son and then scrapping the photos, but I also love taking pics of animals! We love capturing candid expressions of our growing son. He’s changed so much within the first 10 months of his life. OMGosh, I would love to have this! I already have Photoshop CS5 but I haven’t done anything with it! Of course my daughter is my favorite subject but over the past 6 months I’ve really been trying to improve my food photography. I love to photograph nature, still life vignettes and my handsome Tibetan Terrier Monty! What an awesome giveaway!! I can honestly say I love taking pictures of everything! Food, my two pups, family, friends, and places I travel. I would love to learn more about Photoshop! Thank you so much for chance to win this amazing gift. My favorite pictures to take are of my son and his sports. He plays soccer and volleyball. I also love taking pictures of cupcakes and food I make!!! As someone who is in major need of learning the ins and outs of photoshop editing, this would be a real treat! Thanks! Photoshop is an incredible program, but it can be a bit overwhelming–thanks so much for offering a tutorial to demystify it! What an awesome prize! I follow and love both blogs. I love taking pictures of my four girls. I am definitely a novice to Photoshop but would love to learn more. My favorite thing to photograph is my family. We don’t take as many photos as we should and we need to start doing that to preserve our family history. Thanks for the giveaway! With a new baby in the house I would love to learn how to get my photos to look better. I have been following Erin Cobb for a few years now, and have admired her work for so long. I love her clean, crisp style. I love taking pictures of my family interacting with one another. Those simple, quiet (or not-so-quiet) moments when they think no one is watching are priceless. I love taking pictures of my baby boy he is 2 months old. My favorite subject, actually subjects, are my two girls! 18 months and 3 years old. I love capturing them. What a great giveaway!! I love taking pictures of my 2 baby girls!! I love taking pictures of the sky in the country. I love to take pictures of my kids but at 21 and 18 they are not very crazy about me taking their pictures. So I take them when I can!! My favorite subject is my dog, Chloe. My daughters are my biggest inspiration & captures! Your Clean Color product looks amazing! I would definitely love to know your secrets! I love shooting the innocence and wonder of young children the most! My favorite photos to take are my 5 kids, 3 of them are of the 4 legged kind! Who could decide………….but probably my granddaughter is my favorite person to take pictures of. Travel comes in a close second. With a new grandbaby on the way I sure could use to figure out how to really use Photoshop Elements! I love taking photos of my family, including the 4 legged ones! I would love to learn how to take it to the next level. Incredible the difference it makes. Oh i would love this. My daughter is my favorite person to take pictures of. Oh I would love this! I love taking pictures of my family and friends. My favorite subject is my little boy! Thank you for this chance at the giveaway!! I love taking pictures of my kids and I’m getting better at it, but I need to learn about editing photos. I love how Erin’s pictures look on her website and appreciate the chance to win! I absolutley love taking pictures of sweet little babies and their parents. I cannot have children of my own so when I am able to capture that connection between the two I somewhat get fufilled in a void I am not able to fill myself. Wow! Great giveaway! Thanks for a chance to win. I love taking pictures of my family, especially outside in any type of nature setting. I love taking pictures of my daughter! I still have a lot to learn but I love photography! I <3 taking pictures of my little boy. He's 8 now and the years really do fly by. What better way to make those moments stand still then with a picture. Would love to learn about the editing process. Thanks for the chance to win!! I love taking pictures of my two yellow labs, my 1 year old niece and my 2 almost 3 year old nephews! I also like to photograph the beautiful nature all around my home. Awesome giveaway! Currently I take photos of anything that inspires me – clouds, sunset, my two adorable and lovable Boston Terriers, however I’m mostly looking forward to this summer when I can take a gazillion photos of my new baby boy we’ll be meeting in July!! Just found your blog from Linda at The Paper Boutique… I love taking pictures of the outdoors and family events. This Mamarazzi snaps photos EVERY SINGLE DAY!! We have 4 children ranging from teen to toddler, so I enjoy the challenge of capturing their sweet faces. I can’t get enough of my 21 month-old son in his fireman rubber boots these days! Love your work, Erin! My kids are definitely what I love to photograph, though if I ever have the opportunity to travel, I’d love that too! Thanks for this opportunity. I would love to win this! I love to photograph babies! i love taking pics of my backyard and nature as well as food and people…basically everything!! i got the canon rebel sx and would love this tool to make the pics look really nice! i love taking pictures of my friends and family and would love this to make the pics look nicer and cleaner for lasting memories! I Love to take pictures of my daughters! My awesome son….he is three and full of energy and expression! I love taking pictures of children. They just melt my heart. I love taking pictures of my dogs, where I go (every day and while traveling) and just recently I’ve started taking photos of the food I encounter along my life’s path…and I’d love the chance to learn how to make all these photos BETTER through your tutorial! Thanks for the chance to make that happen…winning would certainly add a *wow* factor to my birthday! My best friend is having a baby TODAY! I want to take a millions photos of him! I love taking pictures of family and then looking back years later to see how much they’ve changed! I love to take pictures of everything. From my family to building our house, step by step. Way to many picture to count. But want I would love to have your “Clean Color” for, is I am a Freelance Designer in the Craft industry and it is a must to send in the best photo of my work for companies to use for publications, advertisements, etc. Thank you for the chance to win such a wonderful tool. It has to be my daughter, but food is a close second! I have been trying to teach myself Elements so I would LOVE to have this! I would love to have this to take family photos! I am due any day with my second baby…. and could SOOOO use this!!! WOW! What a great prize, have just started to get in Photoshop and it is oh so overwhelming. I love to take pics of my girls and their sports, right now its track season and the weather is so delightful! What fun! I would love to see what my little ones look like after having some really editing lessons. Beautiful sample pictures! I take the most pictures of my kids and then food. I love taking pictures of my 4 month baby daughter and also of nature. What a generous prize ! I love taking photos of my kids, family and friends and any pretty gardens we visit . Thanks for the chance to win i have ps but find editing my photos intimidating so this would be a terrific help. Love your style Erin. I love taking my photos when I’m traveling!! I love taking photos of ANYONE who will let me!!! I love taking photos of the people who mean the most to me – be it my family or friends who are like family! Would love a chance to win Clean Color. I love, love, LOVE taking pictures of my cat, my family, my home, my friends, my travels…. I’m an avid scrapbooker and even take pictures of friends’ and family members’ weddings as my gift to them. I would dearly love to learn the ins-and-outs of Photoshop so I can make my pictures look even better. I would LOVE to win this! It’s exactly what I need! I love to take pictures of my family and especially of my kids. Lots of my pictures are taken indoors and I’d love to learn how to edit them so that they don’t look quite so blah. Thanks!! I love taking pictures of my family and any project that I work on. I like the editing process to bring the pictures alive. I am new to blogging and taking/editing pictures.I would love to win this product sounds and looks amazing. My favorite subjects are my kids. I especially love taking pictures of them while we’re traveling – they love to look at them and remember all the fun we had! I love taking pictures of our kids & I would love to win this giveaway! Thanks for the chance to win. I love taking pictures of my kids but they usually don’t make it far past the computer because I don’t know where to start with photoshop! I would love to learn! Hopefully I win but if not I think I know what my next purchase will be! I want my photos to POP and a great tool like this would be exactly what they need! without a doubt pictures of my kids. all 5 of them! I actually will be thrilled to win this, I am in the midst of Karen Russell’s class right now (AH-MAZING!) but there are so many things to buy! I have yet to get ready for our week together-and with my “need list” (no longer “wish list”) growing with every week of lessons, this bundle would be awesome! Your photography is awesome. I love how you keep it exactly that-Clean. thanks Erin & Amanda for the fun! My favorite thing to photograph is families!! I love seeing how the relationships come through the camera. Wow! I would love this! You are so talented. I love taking pictures of my family. I have two boys that are very active in sports. I would love to learn how to improve my photos. Thank you for the opportunity. I love to take pictures of my 2 year old twin nephews. Just got Photoshop Elements and basically ‘stare’ at the screen not knowing what to do. Would love to edit all the photos I take of my family. Thanks for the blog post. I think I’m in love with your Clean Color concept. I love to shoot people photos and especially kids. I would really like to learn more about editing in Photoshop. Thanks for a chance to win. photos. I look forward to learning more about you and your work. Thank you Erin for this fabulous opportunity to win your Clean Color give away! I love taking pictures; travels, events, family, flowers and especially my two little granddaughters. I purchased CS4 last year and would love to learn how to “really” use it. I like using my Photoshop but know that I could be doing so much more with it. Having your videos that I could refer to often would be absolutely wonderful! I LOVE taking photographs of family, vacations and events! Thanks for this great contest opportunity! I have 5 precious grandsons that I love to photograph. Would love to take those ordinary pictures and turn them into something so professional looking. Definitely my favorite ever to photograph is my daughter! Since I just learned to shoot in manual mode, via shootflyshoot.com. I love to shoot everything. Just in time to a trip to Maroc Island too! life as it is happening … after all these years, the thought of capturing a moment in time forever is still amazing to me! My favorite thing to photograph are my family and friends, my cats…and I would love to photograph Travels..but sadly, I don’t go anywhere..lol I love photography though and would love to learn how to take better pictures and develop some great skills. Thank you for this opportunity!! My favorite thing to photograph is water. The texture and depth really draw me in. What an awesome chance to win this!!! I love taking photos of people doing what they love to do…I take photos of my students, my daughter, anyone I can shoot really! I love taking pictures of my son and family!! I love to take pictures of my dog, Daphne. She is quite the poser! my three boys and the colorado landscape. My favorite subject to photograph is my son! I have been thinking about getting Photoshop Elements…and would love to win this!!!!! I love taking photos of my Boston Terriers, of course!! I love taking pictures at home. I never tire of finding a new way to view something that I look at every day. Home is my haven. I love taking pictures of family and food. It’s really fun to take pictures of family with food! But I have gotten into my 2 little nieces and trying to master little kids picture taking! My most favorite subjects are children – my own when they were little – now not so much since they hate it and don’t cooperate so they just make me mad…. so now it’s my grand-nephew, my husband, etc., then after that, nature. I hate pictures taken of me because I suddenly seem to gain 80 pounds that I didn’t remember was packed on me… ick. I love taking pictures of my dog and family! my favorite thing to photograph is my kids. they grow so fast! I’m far from being considered a photographer but I adore snapping photos of my family. Would love to learn more on photography. My boys and family are my favorite! What a fun class, I’m always wanting my images to look how I feel they should b their best! My favorite photo sessions are of children. They are so real and spontaneous! I have some knowledge of editing, but it mostly comprises of actions. I’d LOVE to learn how to edit with such fresh colors as in the photos you have here. LOVE IT!!! I always take pictures of my family – this would be great!!! I love taking pictures of my son and our pets. My family – this would be awesome! Thank you. I love to take pics of my kids the most. My son is 19 mos and my daughter 5 1/2. My family of course. My kids are my most favoritist of all to photograph. We are always doing photo shoots! I love to take pictures of the grand kids! Thanks so much for the opportunity to check out your bundle! I just bought my first DSLR…in the hopes of learning Manual mode…to take pix of my children. I love taking pictures of my beautiful daughter. She is beautiful inside and out! I love taking pictures of my wonderful family! I am not the greatest but always want to learn and do more! This program sounds like just the boost I need! Now with things in my life as they are , it is even more important to document everything! I love the color in your pictures. I would love to win the bundle but either way, will be getting the video. I have two grandsons and I never get tired of taking their pictures. My son is my favorite photography subject – we were so blessed to have him, and I don’t want to forget a single moment of this precious time! Without a doubt, my two sons are my subjects of choice..although my English Bulldog is often a more willing model! Definitely family — and food! I love taking photos of the jewelry that I design!! BABIES! I TAKE A LOT OF PHOTOS OF MY FRIENDS KIDS. I love taking candid pictures of my grandchildren! I would LOVE to win this wonderful prize! My kids and family vacations! my kids! lots and lots of pictures of my kids! Thank you for providing such a generous prize! I’m so excited about this giveaway!!! Crossing my fingers. It’s awesome! My favorite picture subjects are my kids…especially my two year old twins. I am happy every time I see their sweet faces!! I’d love to learn how to make their photos pop! I love taking pictures of anything that happens to get in front of my lens! I am excited about this!!! :) Hope I win! I love taking pictures of my kids! I also like to take macro shots of flowers and scenery. I like to make poster prints or canvas prints of the scenery/macro shots. I adore taking pictures of my son. His facial expressions are the best! I love taking pictures of my little grandkids and nature of all kinds. What an awesome giveaway. I love taking pictures in the moment – especially of the kids. I sneak up on them all the time trying to capture what they are doing without posing. So many candids – love it! I love taking pictures of my dog! She is very photogenic! I love taking pictures of my grandkids. They grow so fast! I want to be able to look back and remember them as they grew up. I try to capture all the little things they learn as they are growing ie. crawling, eating food, climbing etc. Any editing help would be a plus! Thanks for the opportunity to win this! I’d love to learn what you have to teach! Great hints and tips. Would love to master these skills! I love to take travel pictures & pictures of family. How I would love to win Erin’s Clean Color Bundle!!! I like taking pictures of my travels. I would love to take good pictures of my spirited Brittany Spaniel, but he does not cooperate. Thanks for the giveaway! I love taking pictures of High School Seniors. They are loaded with personality and fun! This giveaway makes me so terribly happy!! I just baught a Canon Rebel T3i a few months ago and I am totally new to the photography world. I would LOVE to learn how to edit pictures the right way. I love taking pictures of nature the most, but family is definitely a close second. I hope to be as amazing you someday at photography! This would be so amazing and would allow me to do so much with my photography!! I would love to learn new techniques for photography. Thanks for the chance to win. I love taking pictures of food and babies… but not together. :) I would love this! This looks like the EXACT answer to my photography ignorance. What an amazing giveaway. Thank you Soo much! Woops, forgot to say that my favorite subjects are my children. Too excited about the possibility of really knowing what to do to create great photographs! Hi Erin!! I don’t really know what to call it but I love taking pictures of my family and….for lack of a better term, objects. Babies hands, babies feet, flowers at a wedding, candles with a star filter, the back of the wedding dress. You probably get the idea! My favorite thing to take pictures of are flowers in the spring. I love doing bridal shots! Thanks! I also love Amanda’s blog!! I can’t really say I have any favorites to photograph. I have enjoyed taking pictures of family, pets and nature. I am now eager to learn more about food photography and also to fine tune my photography skills when taking pictures of my hand crafted goods. I love to take pictures of family the most. Children grow so fast and everyone changes. Taking pictures of my family allows me and family members to revisit great family times. I’d love to make my pics look as bright as I remember the event being! I love taking pictures of my little guy and my food. I’m a sports photographer nut but I’ve recently gotten interested in casual portrait photography. I could surely use help on my editing skills! I hope I win this, it would be very helpful to me! Love taking pictures of animals and travel… I don’t have any kids, so I never really got into child pictures… but love the animals. Travel mostly. And that could be travel down the street to the botanical gardens. #2 would be my pets. I love to take photos of my boys during their sporting activities—AND I need all the help I can get! I have to say…my most favorite photos are of my family. I also enjoy scenery. I’d sure like to win this one….he! he! I’m a momographer. :) So I’m always practicing on my kiddos. I would LOVE to be able to use Photoshop without actions! How empowering! My favorite subject is my family. I recently took my first photography class, and learned exactly how much I do not know! My favorite of all time is family! There are so many great moments and fun ways to get great shots. This product sounds wonderful! Thanks for the great giveaway. I take a zillion photo of my pets, but I do really enjoy landscapes and close ups of anything.. flowers, water droplets, anything! My greatest inspiration to start learning about photography is my children. When my first was born, I had a local photographer who photographed our wedding, take photos of him when he was 7 days old. It was in his studio, and he included false backgrounds….I thought that the images were fantastic. Then….I discovered a natural light photographer…*sigh* and I was so inspired, that my personal photography journey began. My son is now 3 and I also have an 11 month old girl. All of my photos are SOOC, as I have no idea on how to use Photoshop….. that was on my next ‘to do’ list. Even if I don’t win, thank you very much for realising that there are others out there that are so overwhelmed by editing software. Thank you from sunny Darwin, Australia. I love taking pictures of my adorable six year old niece! And, I love Erin’s photography! Family pictures when they are not looking. Could use help cleaning them up ! People…I love taking pictures of people, of course my favorite people are my family but I love taking pictures of all people! Thanks for the chance! I love taking pictures when I travel. I would love some tutorials to teach me how to edit my photos!! I love taking pictures of family. I have Microsoft digital image from 2000 would love some more options. Thanks!! I am determined to learn photoshop elements this year! This giveaway sounds fantastic! My favorite things to photograph would be kids and landscapes. While I love taking pictures of my dog & my travels, probably my favorite subjects are my family. Our photos of beloved family members are treasured, especially those that are no longer with us. Who doesn’t love to take photos of their family the most beautiful people we know. I also love to take nature photos. I’ll be heading over to check out your site. Thanks so much!!! Love taking pictures of our new baby! I love taking pictures of my family, especially my kids. I’m a novice photographer and this would be such a great help, thank you. I take pictures of everything and anything…but would say my most favorite would be of my nieces having fun (i.e. not posing). I love when I develop a photo with one of their big huge happy grins–and it makes me smile right back at it. GREAT software–first time I heard of it. Pick me! : ) I’m hopping over to your site to check it out–and going to share your blog with my photography friend. I love to take photographs of my daughter ! Thank you so much for this opportunity! Your product looks amazing!! I love to photograph my crazy family and my kindergarten students!! I have photoshop, but I don’t know how to use it! I love to take photos of my 2 children. Thanks for a chance to win. I LOVE taking pictures of my eight (soon-to-be ten) grandchildren and my trips to New York City! I love to photography everything. My twins are my favorite models though. Thanks for the opportunity to win such a great prize! What an awesome contest! My favorite thing to take pictures of? It’s silly, but I love shots of my husband and daughter together from behind. I love taking pictures of family. I wish I could do it better. I think this class would help. I love taking pictures of my sweet little boy, Hank! Awesome giveaway! Thanks! Thank you for the chance to win! My favorite photo subject are my best friend’s twin 4 year old girls. Lots of fun! I enjoy taking photos for my blog and the projects I make along with travel photos. The clean color video would be AMAZING! I can only imagine how many more photos I would take and how they would look so beautiful. I love taking pictures of children/family and scenery. I love taking pictures of my new son and my family. I would love to know how to work photoshop. This is so exciting!!! This is exactly what I need. I bought Photoshop over a year ago but haven’t used it because I don’t know how! I really wish I could learn how to do that in Elements. got it for Christmas and I must confess, it overwhelms me! Actually, I have no favorite thing when it comes to photography. I have my camera with me 24-7 and when I see it, I snap it. I’m totally addicted to photography. My favorite subject is by far my uber-photogenic six-year-old daughter. She makes it easy to get a good shot but I never have learned Photoshop to make them even more dramatic. What a great prize this would be! Wow, very cool! Being a mom, of course I love taking pics of my kiddos. I also like architectural photography. I most like taking pictures of my family. I love taking candid photos of children!!!! Their expressions are the cutest and you can get the best photos of children when you let them do their thing and you just follow them. I love most taking pictures of my boys, but I think it’s easier to take pictures of the food I cook because it doesn’t run away with its hand over its face!! I love taking travel pictures – when we travel I always have my camera with me ready to shoot! Pictures, pictures, and more pictures of my daughter-she thinks I am the paparazzi!! I would love to win this! Thank you for the chance. oh my goodness ~ Would love this and boy do I need this!! pick me, pick me!! I love to take pictures of many things…food mostly ~ my son, my dog, flowers, friends you name it. I do have a southern food blog and have a new camera and want to learn how to improve my skills! Thanks!! I love taking pictures of my family and dogs. What I would really like to improve upon is picture of my artwork (glass). This program would be WONDERFUL! I love taking pictures of my one year old daughter! My favorite thing to photograph is my 21 month old daughter – and come August, I’ll add my newborn son to that! I would LOVE to win this!! WOW!!! I love taking pictures of my kids and dogs. Right now…I love taking pictures of food and the cities I visit. Thanks for the amazing giveaway opportunity! I take a lot of kid pictures. And food pictures. And pictures of other random things. I would love to win! I just got a new camera and love taking pics of my two babies! Now I need to learn how to make them look better! I LIVE ON 440 ACRES AND MY PASSION IS TO PHOTOGRAPH NATURE AND ANIMALS. IT’S SO THRILLING TO CATCH THEM IN THEIR HABITAT! i LOVE taking pictures of our son and family events, I’m SUCH a novice and REALLY want to learn how to take and edit better pictures! I love taking pictures of my babies! I love to take pictures of people being themselves, without a planned pose. Love taking pictures of my bulldog and lab. Thanks for the chance to win!! I love taking pictures of my family and travel, as well as nature photos around where I live. I love to eat…so naturally…I like taking pictures of FOOD! I love taking pictures of my kids! The baby is the one I have been taking the most photos of lately…I also like taking picture of the food we are eating for the day. It is a fun way to share some time with the kids. Thanks for offering the great giveaway! This would be a fun thing to have, something I can learn to play with!! I take pictures of my son the most, and our two dogs! I love to photograph my amazing kids! thanks for the chance to win! I love taking pictures of my kids, usually outside. I would so love to learn how to make my own actions and fix my own pictures. This looks amazing!!! I absolutely would LOVE a chance. I’m learning photography, but haven’t yet tackled PhotoShop. I take photos to capture memories of family, friends, and my pets. Scrapbooking was first my hobby, but that has also led me into the love of photography. There’s nothing like capturing an image that you adore! So excited for the chance to win this prize. I enjoy all aspects of photograpy from wildlife and landscapes to family photography. But my all time favorite is photographing the unsuspecting subject in a way that traps the emotion and feeling of the situation. I just want to learn how to enhance my images without overdoing it. My favorite subjects to photograph are my two litte munchkins – Ezeriah 2.5 yrs old and Adeliah 7 weeks old – they keep me busy! My favorite subjects? My kids of course! Thanks for this amazing give away! This is a wonderful opportunity! My favorite subjects to photograph are my children! I love capturing their innocence! I also find myself drawn to nature! I take tons for pictures! I live away from my family, so i love to take pics of the food i cook and all the fun stuff i do so that i can share with the people back home. What a great product! I’d be thrilled to win and learn how to turn the photos of my family into masterpieces!! FOOD!!! Everything food makes the best subject for photography! Cupcakes, candy, and chocolate, oh my! What an amazing workshop! I love taking picture of my daughter, our naughty pups, and all the amazing things we have wondering through our backyard. Especially the horses! I have been looking for exactly something like this. Thank you for introducing me to it and giving me a chance to win it. Love looove looooove to take picture of Family, Pets, Food and Travel!!! I am learning this art of photography and wanna keep on learning, this is an amazing product Erin. This “tutorial” would increase my photo presentation quality 100%!! I love taking pictures when I travel…all the unique buildings and restaurants! My dog, Oliver, is definitely my favorite subject to photograph. He isn’t very good at sitting still, though, so I usually get lots of action shots or sleepy shots. Either way he’s the cutest! I want to win SO BAD!!! I love taking pictures of my 22 month old grand-daughter, Ryleigh Jane!! I would love to win this — I love takign pictures but mine are often missing that something extra! I think this would awesome!! I soooo need this – thanks for the chance at an amazing gift. I would love to improve my photo taking and editing skills. Thank you for the opportunity! I LOVE taking pictures of my 8 month old son, since he was brand new it has been a blast figuring out my camera features ( thanks to Amanda’s tutorials) . I just love it, thank you for the chance to win! I’m heading over to watch the tutorial when I get home! Your pictures are brilliant! My daughter is #1. Food and nature are tied for a distant #2 spot. I love taking pictures of family and travel! This is an amazing giveaway:) Thanks for educating your readers! I love taking pictures of my kids, even thou one is 12 and he does not like to have his picture taken. I would love to know how to edit better. I love taking photos of my dogs & food!! Thanks for the chance to win this great prize! I love taking pics of newborns and kids. I have been dabbling in PSE and am very frustrated trying to figure things out. I love, love, love photography and want to share beautiful pictures and memories. Editing is my next step! My favorite subjects are definitely kids! I love the reflection in their eyes and how their eyes just sparkle!! Would love to learn more!!! My favorite subjects are my kids (two now and one on the way!!). I love to take pictures of my kids. In fact, I just signed up for my very first photography course! I love taking pictures of people the most! 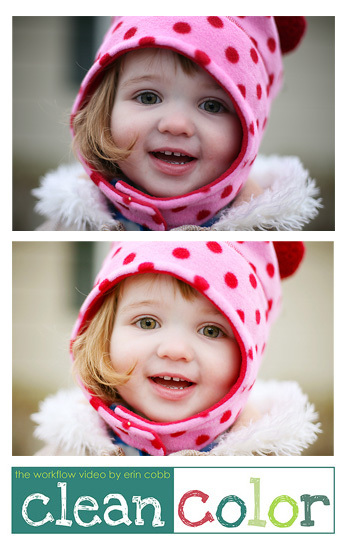 My favorite photo subjects are my six-month-old twin daughters! I try to snap a few pics almost every day to capture their amazing development during this time in their lives! I love taking travel photos – but don’t get to travel nearly enough. But the photos I have the most of are the ones of my family. I love to photograph my family. My favorite thing to photograph is my new baby girl! I love taking pictures of my kids – ages 2-12. Photographing them at the beach is a favorite. Can’t wait to learn some new editing tricks for Elements! This looks so helpful. I recently have transfer over to working in PSE. Slow transfer, PSE is very confusing at times. I upgraded to a dslr last May and have loved evey min of learning more and more about photography. My 3 girls are usually my main subjects. She grow up so fast so taking photos of them is a great way to remember them when they were little. :) Clean color looks amazing! So excited thanks again!! I love taking photos of my kids. I have them all over my house. I also have been taking photos of a couple friends and their kids. I am just one of those people who always have a camera in hand becaue I just love taking photos. I love taking pictures of my baby girl and my family! I love taking pictures of travels and adventures we take. I am a beginning photographer since my daughter was born a year and half ago so I would LOVE to win this and learn to improve my photography! Hands down my 20th month old son! He has the greatest expressions and it so much fun to see how much he changes day to day. Thanks so much for the tutorial. I could use all the help I can get. I love taking pictures of my 2-month-old son, Noah! I take pictures of my son and my dog the most. Well that’s pretty much all I take pictures of! My current passion is photographing dogs/cats in dire need of good homes for rescues. My main photo subject is outdoors…from large views of the landscape to smaller, up close photos of a single plant/animal/insect. I love taking pictures of my kids when they don’t know I’m watching them. I don’t know how to nail down what I like to shoot the most, but if I had to it would be abandoned things, cars, buildings, land, ect. But I usually think my favorite thing is what I am shooting at the time. I would love to learn more about photoshop, super excited for this! Love taking pictures of everything, my son mostly. I’m really starting to enjoy landscape photography, though! I love to take pictures of my beautiful boys and all of my clients! This is very cool. I love taking photos of my kids and nature. my 4 year old daughter! I Love taking portrait pictures of children and babies.. Without a doubt would love to learn more about Photoshop Editing. Thank you for this great opportunity! I take pictures of my family and Photoshop is still another language to me, I would love love love to win this amazing gift! Thanks! No kids yet, so most of my pictures are of cards I make for my blog, or my husband and I hanging out in Boston! Thanks for this fantastic giveaway! My favorite subject to photograph is my daughter. Over the past 2 years, I have taken probably over 3000 pictures of her. Yeah, I know — I have a problem! A tool like this would tremendously help turn my so-so photos into great ones. I can’t wait to see who wins! What an awesome giveaway! I love taking pictures of my two kids and the cute things they do! Love taking pictures of family! sounds like a wealth of knowledge, and who doesn’t want their photos to look this great!? i love taking photos (especially close up shots) of my boston terrier. that’s why i especially love when amanda features their puppies! thanks! Ooh, please, pick me! I already follow your blogs, Erin, and I’d love to win! Thank you for the chance to win this lovely prize. Favourite to photograph – hands down my gorgeous grand-kids! My favorite thing to photograph is EVERYTHING! I drive my family crazy now that I have an iPhone at my fingertips every second. I’m teaching myself to use Photoshop now… HUGE undertaking. This would help so much as I learn this daunting program. With 4 kids, I NEED THIS!!! I spend sooo much on photos….. I love taking pictures of friends and family! I love taking pictures of anything random. Nothing posed and life as it lays. I also love to photo my children. Thanks for the great giveaway! Now that my kids are grown, all I take picture of are my finished knitting projects to post on Ravelry! There is still some ‘staging’ to do there, too. I love taking pctures of my pug, Pork! I take pictures of my two and three year old. Would love to win this prize! I love taking pictures of those heartfelt moments!! Be it family, or friends !! And I can always use help in honing my skills!! My favorite “thing” to take pictures of is my 7-year old granddaughter…..to the point that I sometimes completely annoy her with my snapping away! This looks like a really fabulous product …. would LOVE to be the winner! I enjoy taking photos of people and food, and would love to learn how to make them better. My dogs, by far my most frequent subjects! I love taking outdoor shots of my boys. I love taking pictures of traveling!! I love to travel to & take wide angle landscape pictures of the mountains and the beach. Just learning the ins and outs of producing a great photo, I need all the help I can get. Love your photos!! I am actually from Huntsville and living in Birmingham, so you guys better believe I am checking out your photography for future use! I take the most pictures of my two precious babies! I invested in a DSLR two years ago, and I’m still such a beginner it is pathetic! I just got a new camera for Christmas. Nikon d5100. I have been to 2 begineer photo classes. Still have no clue how to take the great photos. I love taking pictures of my hubby, our 3 yr old daughter, and white Labrador! I so could use this give away! I love taking pictures of my family, particulary my grandbabies. What an awesome giveaway! I would love to win! I love to take pictures of my three children. Would love to try a new editing tool! Oh how I would LOVE this prize! I love to photograph my family…I have two little girls; a 3 year old and a 5 month old and they’re growing up way too fast, so I take as many pictures of them as I can! Pets, mine of course, two beautiful Golden Retrievers! My favorite to take photos of is my children and closeups of things I love! Thank you! oooooh, I would love to have Clean Color! I love, love, love taking pictures of my kids, but since I’m a little behind in my quest to fully understand how to use my DSLR, there’s always some color issue I wish I could correct. And I’m even more behind in my quest to understand how to edit pictures LOL! Thank you so much for the giveaway! I love taking pictures of expecting mommies and babies!! But most of all my own children!! I love taking pictures of just about anything but especially my baby girl! I LOVE TAKING PICTURES OF FOOD!!! ooops…forgot to say …i love talking photos of my triplets and my wacky pets! oh please….oh please…oh please…crossing my fingers to win…THANKS! Photos of everyday life. Would love to say “my family” but they all live far away. I love taking pictures of life! Whatever is important on that particular day! WOW! I get so frustrated trying to get a photo corrected and look gorgeous! So excited to learn about tips and tricks. Keeping my fingers crossed for this giveaway…I would love to be able to make my photos look fabulous! I love taking photos of my cats and niece! My three dirty, adorable boys! Always love to learn new editing techniques!! Hands down my own kiddos and ANYTHING at Disneyworld! :) Thanks for a great giveaway! I’d love to get Erin’s materials! Thanks! I would love to win this package to improve my photography! I just got Elements as an early birthday present, and this would be awesome to help get me started! My favorite subject to shoot, at least right now until I have kids, is my cat. I just got a new camera and take pictures of everything!! I mainly take pictures of my family, but would love to travel more and take pictures along the way. I SO need help to produce a better picture and would love to win this!! Thanks so much! I love taking pictures of my Family, our dogs, landscapes, flowers, bugs, animals of all kinds. I would love to learn how to improve my photos thru Photoshop…..It is overwhelming when you first start trying to use Photoshop/Elements…so any help would be awesome! I love taking pictures of people without them knowing it. I love taking pictures of my 4 children & my husband. When they sit still for 5 minutes! The actions look amazing! I love taking photos of family and landscapes! I love taking photos of families & kiddos. So much fun! I love taking pictures of family :)! My 3 sons are my favorite things to photograph. This looks like a great way to make good photos amazing! Amanda, thanks so much for sharing your friend Erin with us!!! I LOVE taking photos of my four-legged son Oliver and all my nieces and nephews! I can’t get enough pics of my sweet, firey, vivacious one year old! Thank you for the giveway. My favorite thing to take pictures of is family….more specifically, my daughter. This looks fabulous! All my pictures tend to be dark and muddy. My pics are 90% my kids and 10% business related. I love to take pictures of my family.. they don’t always turn out well but I love trying to catch them in funny poses. I love to take pictures of EVERYTHING! Unfortunately, I don’t ever know what to do with them after I take them! This would be perfect. I just learned to use actions so this would be fantastic!! I feel like a cheater sometimes!! :) I love to take pictures of my boys and sometimes the conditions aren’t always perfect. Thanks girls. Thanks for the chance to learn! My favorite subject to photograph is my everyday life. I love taking photos of my friends, pets, the places we go and most especially my family! I love taking pictures! I take them of my crafts, and of my grandchildren, of the recipes I make up, oh, and I love taking them of the hummingbirds that visit our feeders (up to 20 at a time! No, I am not kidding!!) I just love taking photos. My husband bought me photoshop, sadly I have not used it – well I did try to use it, but… I would love a program to help me get a better result! My favorite photos – my grandchildren – all of them! I love taking photos of trip we take and everything we see and do along the way! Love to take my kids photos! I love taking pictures of my two kids, of course! My passion is capturing both the special things we do as a family and the little things that make up our everyday lives. As a 3rd born in my family, very few pictures were taken by the time I came around and I hope leave a better visual history of my kids’ childhoods for them (and me) to enjoy. I’ve tried using Photoshop Elements in the past but beyond the very basic tasks I am completely lost. Oh wow! A specific tutorial! That’s amazing and so helpful! I love taking photographs of scenery and candid photos of people. My ultimate goal for y photograph is that it should look like a high quality postcard that you would love to send to your loved ones. Thanks for the amazing giveaway Erin and Amanda! My favorite things to take pictures of are children. I would love to learn how to clean up my photo skills. I enjoy taking pictures of our children and our travels……beginner in photography but my daughter would really appreciate this. I love to take pictures of my beautiful daughter and soon my newborn son! Family! But they hate to have their photos taken. I do love to shoot seniors or teenagers that are willing! Thank you for the opportunity to learn! I LOVE taking pictures of two of my favorite people in the world – my kids!! Wow, what and amazing give-away, definitely entering this! I take a lot of photos for a knitting blog I have as well as a lot of general hobby photography. This would no doubt speed up my editing process (or my lack of editing process) like mad! My daughter and all of her firsts! I love taking pictures of my kids! I definitely take a lot of photos of my family, more so than anything else! I do need some work on taking more animal photos…we have two new rescued italian greyhounds, and I would love to take better photos of them. I love to shoot anything that strikes me as joyful or beautiful. It could be a particular flower in my garden to a friend’s child running around a park. Kids are so full of joy and I love to capture that! This would be so amazing for fixing photos of my family that were taken in poor light conditions. I also have a blog and this would rock the blog photos! i thought i loved taking photographs before my son was born…now that he’s here, i realize i had no idea. taking pictures of him brings me so much joy! That is a tough question….what DON’T I love to take pictures of?! I absolutely love taking pictures and have turned it into a part-time business. I am currently trying to work on perfecting my workflow (I spend WAY too much time in editing) I was so excited to see this post. Especially since I love your edits! Everyone has a different style and I love your nice clean edit. Clean Color is a perfect name! I take a lot of pictures for scrapbooking and I still don’t have a good photo editing program. This would be great!!! If I had to pick a favorite, I’d say my favorite thing to take pictures of is people! Namely, my family and friends. I love capturing their spirit and preserving memories :) What a great prize! I definitely enjoy taking pictures of the people I love the most…everyone else is a close 2nd! P.S. Forgot to mention I love taking pictures of landscapes, sports and my family (if they’ll stand still long enough). I love to photograph my yard,with the changing seasons.. I will take pictures of just about anything. I do a lot of outdoor landscapes, but would love to start photographing some of my interior design projects too. As a LR user I have no idea how to edit in PS and would LOVE to win this! I love to take pictures of my dog Zoey and Lake Michigan. I love taking pictures of my nieces and nephew, but I have a feeling my favorite subject will be my own kiddo when he or she makes an appearance in a few weeks. I love to take photos of our grandchildren, but when they’re not around hummingbirds are at the top of my list! I love taking pictures of couples. I LOVE, LOVE, taking pictures of my family……especially my grandson Cooper. He calls himself Pooper!!! SO CUTE! I love shooting children. They are so animated and lack the inhibitions that adults sometimes have. I love takin pictures of my little guy and also some of my friends cuties too!! !